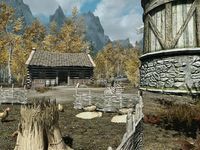 Snow-Shod Farm is a small farm south of Riften that is owned by Vulwulf Snow-Shod. Addvild and Leonara Arius live there and run the farm for Vulwulf. There are two buildings on the lot: a farmhouse and a windmill. In the field, there are four bushels of wheat , ten leeks and five potato plants, all of which Addvild will pay you for gathering. There is a Gourd, two patches of Scaly Pholiota mushrooms, a red, a blue and a purple mountain flower all growing in and around the farm. There are also four chickens, two nests for collecting chicken's eggs and one cow that produces milk all on the farm. 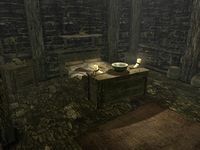 Entering the farmhouse brings you straight into the main living room, with a cooking pot on a stand against the northeast wall. Coming out from the southeast wall is a large wooden table with benches either side, with a bottle of wine, two salmon steaks, a portion of grilled leeks, a loaf of bread and an eidar cheese wedge on top. There are food sacks and barrels all around the farmhouse. On the southwest wall is a wall shelf holding clutter, with a chair against the same wall and a cupboard further to the right of the chair. The cupboard holds a bottle of alto wine, a bottle of Nord mead and three loaves of bread. Above the cupboard, hanging from the ceiling are two garlic braids, two bunches of elves ear and two bunches of frost mirriam. A doorway to the northwest leads to the top of a flight of stairs leading down to the cellar. The stairs descend to the northeast. 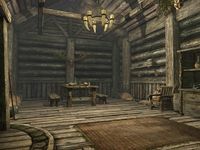 At the bottom is a storage area with a pile of firewood and a couple of straw bales under the stairs and against the southwest wall is a set of shelves that hold several potatoes, a cabbage, two loaves of bread, several pieces of cheese and a copy of the Alteration skill book Reality & Other Falsehoods. There is a dresser to the left, against the southeast wall with a bottle of wine atop. To the left is a doorway through into their bedroom which consists of a double bed coming out from the middle of the southeast wall, with a wall shelf above the bed holding a bottle of alto wine and a dresser at the foot of the bed with a bowl on top. In the eastern corner is an end table with a copy of Rising Threat, Vol. IV, a chair against the southwest wall and a wardrobe in the northwest corner containing clothing. The farmyard is one of the common places you can encounter the revelers.